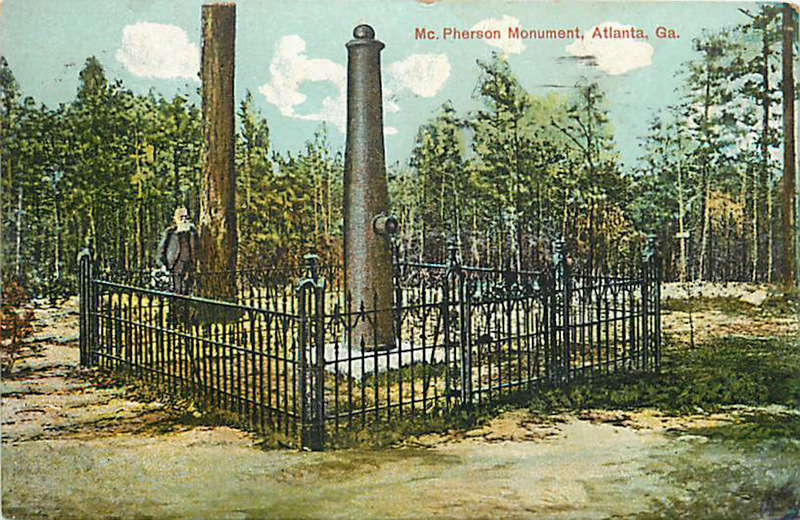 The McPherson Monument in East Atlanta, as rendered on an German-made 1880s postcard. Image courtesy of Henry Bryant and Katina Van Cronkhite. 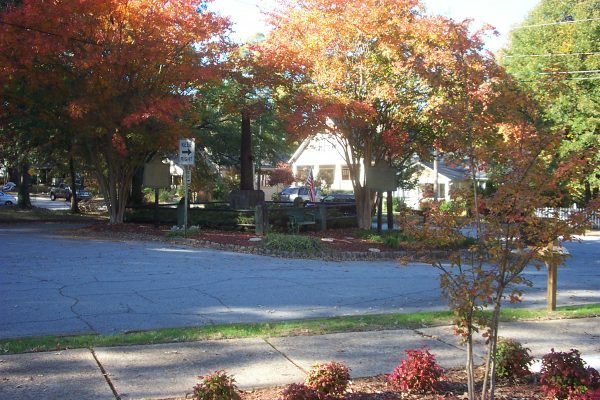 One hundred and fifty years ago, my colorful East Atlanta neighborhood sat two miles outside of the city limits. By July 22, 1864, Union troops had set up their front lines along a trail that later became our main street. When the Confederates decided to bring the fight to their enemy, these quiet woods became the location of the devastating Battle of Atlanta, where some 12,000 men were killed—including, rather unusually, two opposing generals. Today, a short walk from my house, memorials to the two men—Union Major General James B. McPherson and Confederate Major General William H. T. Walker— still stand where each officer fell. The monuments, upturned cannons on pedestals typical of the Victorian era, go mostly unnoticed. Neither is in great shape. Walker’s is particularly sad. 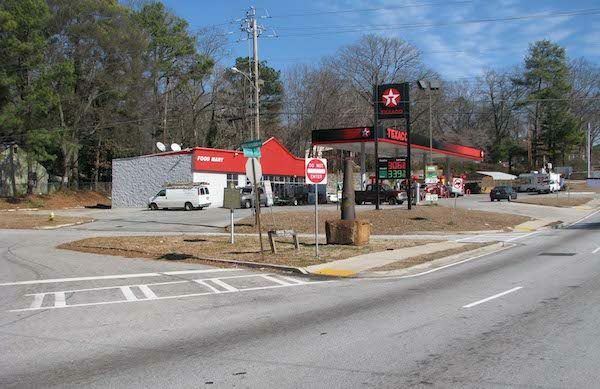 It sits aside an onramp to Interstate 20, a major freeway bisecting Atlanta, next to a Texaco convenience store. It has been hit by automobiles, many times. It’s cattywampus—crooked—on its foundation. My neighbors and I want to restore these monuments. We’re a diverse group, of different races, ages, genders, and political ideologies. We want to fix up the McPherson and Walker memorials because they’re one of the few remaining records of Atlanta’s past. There are many layers of history here in East Atlanta—from the Indians to the pioneer farmers to the Civil War to civil rights. 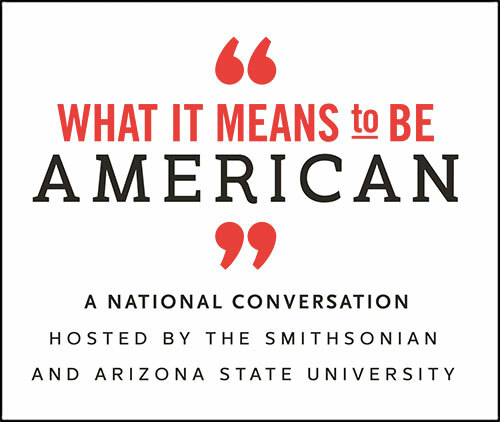 Reclaiming all of them is crucial to understanding our place in American history. The Walker Monument, orange and next to the Texaco star, sits on Glenwood Avenue where General Walker fell at the westbound entrance ramp to I-20. Photo by Henry Bryant. When my wife and I first moved to the neighborhood in September of 1980, we didn’t know any of this. We just wanted to renovate an old house in an area that we could afford and we had finally found one—a 1906 home with a Victorian cottage floor plan—that fit the bill. One cold and rainy day that fall, a man showed up on our front porch with a metal detector, asking for permission to explore our front yard. This was where the Battle of Atlanta had happened, he explained, and he wanted to see if he could find any souvenirs—swords, belt buckles, grapeshot balls, and the like. I politely told him that if anyone was going to find anything on my property it was going to be me. Thus I learned that I lived on a battlefield—and the realization launched a decades-long quest to learn everything I could about East Atlanta, and to understand a piece of our history that many people in this city, both black and white, have been too willing to forget. I became involved in local politics, joining a neighborhood organization that worked on planning and quality of life issues. At the time, a lot of groups like ours were hosting home tours to fund redevelopment efforts. We wanted to be different. We had one asset no one else did: the Battle of Atlanta in our backyards. The actual fighting fields had long been supplanted by urban development and a grid of residential streets. Geographic features and the paths of old trails were still evident, though, so that our committee could research and locate landmarks and sites of the conflict. We hosted festivals to commemorate the battle, and created a van tour designed to tell people the story—a tale of accidents and miscalculations. The McPherson Monument. Photo by Henry Bryant. win many battles but were successful in delaying the Union’s approach to Atlanta. It was July, steamy and hot, when the forces finally made it to the city. The ill-fated generals were killed before troops had fully reached their positions. Walker was first. He and his Confederate soldiers had gotten lost on their way to the battle, mired in muck on the banks of a 35-acre mill pond. Walker set off across a creek, on a big white horse, seeking a better vantage point—unaware that Union sharpshooters were tracking him from their perch on a nearby hill. When he re-entered the clearing to return to his men, the riflemen fired, and he fell. The Union forces were also on the move, filling gaps in an attempt to slow a surprise attack. McPherson, the more important military leader of the two, also died before the actual battle had begun, shot from his horse by a group of Confederate infantry who caught him off guard behind his front lines, on the Old Wagon Road. A t-shirt featuring Generals McPherson and Walker at Kaboodle in East Atlanta. Photo by Tony Crump/East Atlanta Community Association. After the war, in 1877, federal soldiers stationed in Atlanta built McPherson’s memorial; Walker’s memorial followed in 1902. East Atlanta grew and transformed itself around the monuments. The mill pond was drained. The trails soldiers had followed during the battle were paved over. Developers dotted the area with houses and schools and business districts; in the 1960s, the federal government built Interstate 20, which bisects Atlanta. Atlanta’s black middle class began to grow soon after the end of the war, and over the decades the city became the birthplace of the Civil Rights movement. Martin Luther King was born here, in 1929; the city elected its first black mayor, Maynard Jackson, in 1973. Today our city is a mecca for African-Americans, who have thrived politically, economically, and culturally. There have been times when some of our black neighbors in East Atlanta and throughout the city have questioned the utility of dredging up the war’s painful past. Our group’s mission has always been to explore American history —not just the Confederacy and not just the Union. It’s not a story of black and white, but a story that is shaded with a wide range of tones. We want to tell the whole story, not just one side. Our events have long featured programming about East Atlanta’s civil rights history as well as its Civil War history. In a city like ours, which is always tearing everything down in the name of progress—the Falcons’ 25-year-old Georgia Dome, for instance, is scheduled for demolition later this year—we wanted to provide a tangible bit of history to make the neighborhood proud. East Atlanta has gentrified. 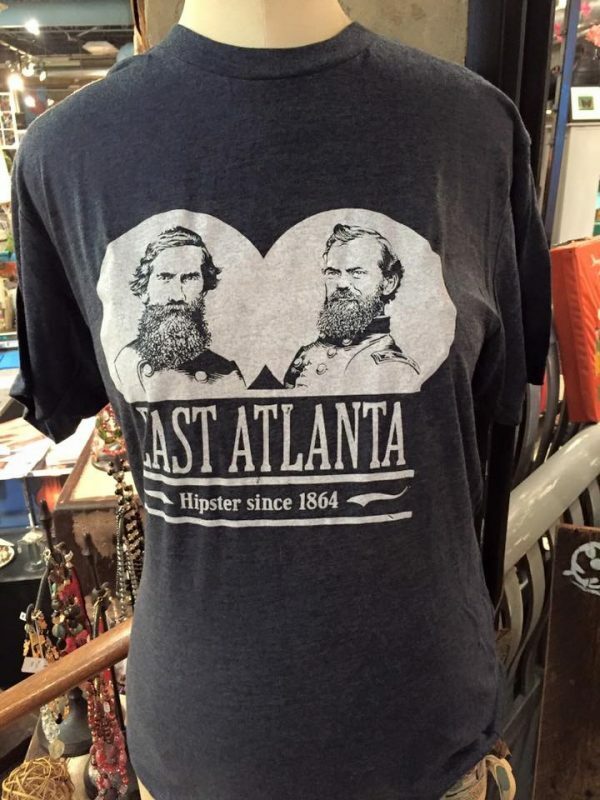 These days, pushback to our battle-themed events can easily come from young progressives, who tell me they “don’t expose their kids to violence.” (Although some millennials recently embraced an East Atlanta t-shirt that featured the images of the generals, who both wore long beards, with the tagline “East Atlanta—Hipsters since 1864.”) But ours is a peaceful message. There’s nothing that inspires peace like the horrors of war. When you understand the alternative, you want peace even more. A rendering of plans for the restoration of the McPherson and Walker Monuments. Image courtesy of BATL and Pimsler & Hoss Architects, Inc. The Battle of Atlanta can be the beginning of a conversation about race. The restored McPherson and Walker monuments will be an integral part of our effort to tell East Atlanta’s history. We’re on track to raise the nearly $200,000 it will take to restore the sites. We also have plans on the drawing boards to create a trail to connect them. It would wind along city streets and pass through unused rights of way. There’s a creek along the path, too, where we want to create a green space. There we’d like to place historic markers that will tell East Atlanta’s story —all of it, and not just the tales of the blue and the gray. As it happens, the hill where the Union sharpshooters gunned down Walker is now home to a high school. It was one of the first in Georgia to be desegregated, in 1961, when nine black students began attending classes at four all-white schools. It brings things full circle, having a major Civil War site next to a major civil rights site. Henry Bryant is a marketing executive and community activist in East Atlanta, a neighborhood southeast of downtown Atlanta. One of the creators of B*ATL, a commemoration of the Battle of Atlanta, he also has worked in local politics, once serving as the city council campaign manager for the late civil rights leader Hosea Williams. He is the co-author, with Katina VanCronkhite, of East Atlanta, a history of the area.